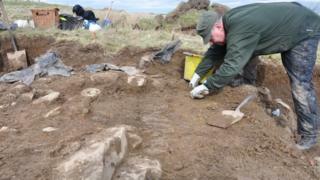 Archaeologists are excavating the site of what is thought to be an Iron Age home known as a wag. A small scale excavation was done at Burn of Swartigill south of Wick in Caithness in 2015. A copper alloy fragment thought to have been part of a brooch possibly worn by a person of high status was among finds made two years ago. The University of the Highlands and Islands' Orkney Research Centre for Archaeology is leading the latest dig. The centre is working with Yarrows Heritage Trust and local volunteers. Finds made so far include a fragment of ceramic pottery. The dig has also begun uncovering a stone structure. Heavy snow falls led to the suspension of work at the dig site on Monday but it is expected to resume again this week. Wags are Iron Age buildings found elsewhere in Caithness and neighbouring Sutherland. Their construction began after a period of broch-building. Brochs were large stone towers and remains of them can be found across the Highlands and in the Northern Isles.